Perhaps we can start by agreeing there is no such thing as Consensual Surveillance, for if there were, we would all be ticking boxes on Census-like forms offered to us by benevolent government entities keen to surveill us with our consent, saying Yes! You can surveill me, adding, defensively, as many of the unthinking among us do, After all, I have nothing to hide. What can Consensual Monitoring possibly be? Is the FBI defining a form of monitoring and surveillance it engages in as Consensual, in hopes of “keeping it legal”? One clue they offer is that it’s “Other Electronic.” It’s not Aerial Video. It’s not Aerial Photography. Can it be Aerial Cyber Surveillance? (Why would they need to do that from the air, when it would be far more effective from the ground?) It’s Non-Telephonic. So it’s not Stingray, Dirtbox, cell-phone-tower-mimicking scooping-up of cellphone voice and text data. It’s Electronic, and it’s Consensual–so they say–and it’s not Video, Audio, Telephonic, Cyber-related. “FBI evidence logs reveal that at least half of the flights conducted video surveillance, and that the FBI retained copies of those videos in its files. Other flights conducted some type of “electronic surveillance,” but specific descriptions are redacted. This suggests that those flights were perhaps using more sensitive or powerful recording gear than just video cameras, though what kind we don’t know. 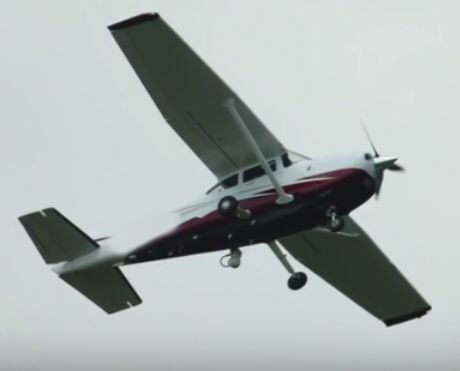 “Scores of low-flying planes circling American cities are part of a civilian air force operated by the FBI and obscured behind fictitious companies, The Associated Press has learned. The AP video report that accompanies a Blaze article on this same AP report identifies the spherical white protrusion with cable on the fuselage as a ball camera to provide sweeping panoramic views, but the other equipment is not identified. “Evolving technology can record higher-quality video from long distances, even at night, and can capture certain identifying information from cellphones using a device known as a “cell-site simulator” — or Stingray, to use one of the product’s brand names. These can trick pinpointed cellphones into revealing identification numbers of subscribers, including those not suspected of a crime. On the subject of technology currently being used in Aerial Surveillance by Law Enforcement, and by Military PISR operations (Persistent Intelligence, Surveillance, Reconnaissance), see this slide show presentation from the company Persistent Surveillance Systems, linked in pdf and posted Jan 2014 at PublicIntelligence.net, which includes suggested policy statements on Persistent Surveillance for Law Enforcement, among other things. The image below of the Surveillance Systems market size is from this pdf. Also posted at Public Intelligence is the US Joint Command Handbook for Persistent Surveillance. The Washington Post ran an article on this subject in Feb 2014. Also see the video produced by the Center of Investigative Reporting and PBS demonstrating this system. Essentially, what they say is that Wide Area Persistent Surveillance camera systems that are carried on planes offer panoramic views of large areas such as whole towns and cities, several miles (up to 25 miles in reports) in diameter, and the way they are used is to generate real-time video by having the planes circle interminably over defined areas, for about six hours at a time, combining the data obtained thereby with that from networked ground cameras, traffic cameras, gas station cameras, etc., to create a detailed picture in real-time of what anyone is doing, outside, on foot or in cars/vehicles. CIR and KQED’s video on surveillance below introduces this system and also touches on biometric intelligence, and other forms of surveillance. ACLU also discusses this issue, and elsewhere covers wide area surveillance (ARGUS-IS) from drones as it raises privacy concerns. Merely as reference, consider too the kind of wide-spectrum surveillance and data collection in process currently with Military Persistent Intelligence, Surveillance, and Reconnaissance programs, which use continuously-generated data from planes, ground stations, and satellites, as illustrated in this Raytheon UK overview image, from a Dec 2014 AIN Online article (Raytheon UK Develops New ISR Solutions). Note especially SATCOM–how satellites are being used to network data from the ground, from aircraft, from mobile forces, and from “tactical” ground stations. Electronic Warfare aircraft, whose collection of ELINT, COMINT, SIGINT–Electronic Intelligence, Communications Intelligence, Signals Intelligence–is achieved through sophisticated radar systems, electronic jamming systems, and radio antennas, use various networked tools to engage in Persistent Aerial Surveillance. So, looking again at the FBI surveillance plane imaged above, one might just wonder if it’s possible this high-tech FBI surveillance aircraft is merely a smaller, streamlined version of the plane below, carrying compact Electronic Warfare collection/jamming systems for Persistent Intelligence, Surveillance, Reconnaissance. Not to be forgotten is the fact that Electronic Warfare, which has been covered previously in this post here, includes electronic surveillance and remote electronic signals collection–by which is meant a variety of electronic signals, as this Army Concept Capability on Electronic Warfare for the Future Modular Force 2015-2024 document details, including remotely-culled information from computers and electronic communications. Electronic Attack, one of the three Army-Doctrine aspects of Electronic Warfare, seeks to use electromagnetic energy to attack personnel, as well as equipment, and Electronic Warfare Support seeks out sources of intentionally and unintentionally radiated electromagnetic energy for threat recognition and targeting, as this overview image from the Army Concept Capability document illustrates. Widely-posted –although less-well-known–information from the ’90s on NSA Signals Intelligence reveals that SIGINT also includes information on human bioelectric fields and EMF thoughtwave forms (unintentionally radiated energy), as noted by John St.Clair Akwei in his lawsuit against the NSA (See especially the Section, NSA Signals Intelligence uses EMF Brain Stimulation for Remote Neural Monitoring (RNM) and Electronic Brain Link (EBL)). It turns out the FBI has Department of Justice-specified Procedures for Consensual Monitoring. See this Sep 2005 report: Chapter Six: Procedures for Lawful, Warrantless Monitoring of Verbal Communications (Consensual Monitoring)/FBI’s Compliance with the Attorney General’s Investigative Guidelines (Redacted) Special Report. “Consensual monitoring is the interception by an electronic device of any wire, oral, or electronic communication where one of the parties to the communication has given prior consent to the monitoring or recording. A warrant is not required to conduct consensual monitoring, and the party providing consent may be a government agent. See 18 U.S.C. § 2511, (2) (c) – (e) (2002). Further, the report goes on to specify that DOJ permission to monitor is required only in the case of “sensitive individuals” such as members of Congress, Governors, and other public officials, and duration of monitoring be permitted in those cases for only up to 90 days at a time. For all other parties–such as you and me–no permission is required other than a sign off from a Special Agent at the local FBI office, and duration of monitoring may be marked by said Special Agent as “for the duration of the investigation,” may be conducted by anyone, including possibly Government agents, and doesn’t need a warrant or DOJ approval. Is Consensual Monitoring Accomplished via 1), Recordings Unilaterally Consented-to by Hundreds of Thousands of Recipients of National Security Letters, & 2), Covertly Implanted RFID transponders? and Consensual Monitoring Two; The “body recorders and transmitting devices” spoken of are biomems, RFID chips, MicroElectroMechanical devices, neurostimulators, and the like, covertly implanted in individuals, which do indeed function as “body recorders” and radio transmitter/receivers. Of course, this is scarcely Consensual communications, even if it is a two-way radio communication, since the implants themselves are non-consensual, but is an attempt being made here to pass off RFID transmissions as “Consensual Monitoring”? This brings us to the CIA, and a June ACLU article by Staff Attorney Ashley Gorski, New Docs Raise Questions About CIA Spying Here At Home which revealed the recent FOIA-requested (by ACLU & Yale Law School’s Media Freedom and Information Access Clinic) release of several documents–eg., the CIA’s own internal regulations on spying in both foreign and domestic areas, titled AR 2-2, a CIA/FBI Memo of Understanding regarding foreign and domestic intelligence collection, and others, related to the CIA’s collection programs under Executive Order 12333. These documented regulations apparently govern the domestic activities of the CIA, in its human subject research programs, its domestic intelligence collection programs, its foreign intelligence collected-domestically programs, its domestic monitoring programs, and its co-ordination with the FBI in domestic electronic surveillance and monitoring. This ACLU article, and all the documents it points to, in particular the document AR 2-2, which clearly notes that the CIA engages in human subject research and experimentation programs–an issue of profound concern at this site, deserve close reading and analysis, and will be examined further here, in a succeeding post (when redactions will be filled in, speculatively). Further posts here will specifically examine CIA involvement in ongoing classified human subject research and experimentation programs, and the nature of the transmitting devices/monitoring devices–radio frequency implants– being self-authorized for CIA/FBI use in undisclosed Remote Monitoring programs. For an inside look at one extraordinary instance of the documented CIA use of biomedical implants in Intelligence collection as a surveillance method, see David Larson’s 2009 testimony, lawsuit against the CIA, and report with photographs. Thanks to Jean of Co-Creating Our Future on Planet Earth for pointing to this film. This documentary–Take Back Your Power, winner of the 2013 Indie Fest Annual Humanitarian Award, winner of the Leo Awards Best Feature Length Documentary 2014, winner of the Aware Guide’s Best Transformational Film of the Year, 2013--which opens with this powerful quote from Frederick Douglass, and an unvarnished moment of truth from the Maine Public Utilities Commission, reveals the being-shrouded truth about smart meters, the huge and detrimental amounts of EMF radiation (radio frequencies) they pulse into homes, the wide-ranging and intensive health hazards of this radiation, the billion- and million-dollar deals made between utility/energy/power companies and governments to install them, the “Smart Grid” which presents itself as consumer convenience and turns out to be both source of extreme consumer harm and yet another putative harbinger of Full-Spectrum Surveillance, courtesy the Dream of the Totalitarian State from the Dreamers of Even Greater Control Over Populations. 1 hr, 28 mins long, can be watched online at this link, available for free currently until December 1, 2015. Getting informed is the first step; the next step as always is up to each one of us–please share this information widely, please consider what steps you yourself might take to inform others and to stop the smart-meter roll-outs in your neighborhood. More than ever, right now, while mayhem seems to reign politically, we each need to stand in our own truth, and find the courage to speak out, to act, to add our voices to the growing chorus speaking out today for humanity. I am personally convinced our various thoughts, words, and actions of courage will create the right energy to push back the tide of contrived violence currently rampant on the planet. I wanted to find out for myself if this was really happening. So, I grabbed a camera and travelled around the world. That’s not even the half of it. They are instead a full-fledged onslaught on your health, your privacy, your rights as a citizen, your wallet, and your freedom to make the best choices for you and the ones you love. Above, I’ve made the full documentary available for free for a very limited time. Watch it. Share it. Send this link to everyone you know. Smart meters have been covered here previously, on the subject of smart meter fires, and covering Canadian activist Brian Thiessen‘s clear and informative talks and presentations. Also: Take Back Your Power has a great Solutions Page where you can find out how to connect with local groups opposing smart meters, establish No-Consent with your utility, or get further information. Visit their site for news and video updates from around the world too. This post, on WACCOBB.Net, Connecting Conscious Community, shows photos to help you identify if you have a smart meter or analog meter. 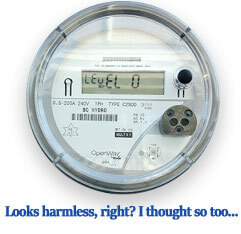 Notice of Non-Consent: A lawful strategy to deny consent to your utility to install a smart meter may also be found at this site, People for Safe Technologies. Another great site for legal notice templates and letters and information is FreedomTaker.com. This rather inspiring video (about 10 minutes long) posted on Youtube by Youtube user sonygvf is from 2010 and shows Robert D. Steele, a former CIA officer, who has also worked in the Marine Corps and in Counter Intelligence, speaking with passion on the issues facing the USA today–of a broken Constitution, a failed Federal Government, an unwieldy and intrusive Intelligence complex, complete failure of the media; and pointing out that we are in a historic moment right now, when bloggers and citizen journalists have a tremendous opportunity to focus on an issue and work with persistence to blog, expose, and bring it out into the open. He echoes my conviction that in the presence of a Failed Media–as we are currently–it’s up to us to speak out. Structured citizen journalism will hold the criminals accountable, and we must hold them accountable. We must speak out. “Sovereignty” is a word that’s being appropriated and demonized within the Security State, as Constitutional attorney, scholar, and public speaker Kris Anne Hall points out, and it is worth looking at what “Sovereign” really means. A young intern with her organization, Elizabeth Manley, has written an intriguing letter which is posted on her website (linked below), and I highlight a small excerpt below from it, which calls on all of us to speak out against the abuses of our Government, when our Government is abusive–note, this is the voice of an 18-year-old. (Follows the note on Sovereignty.) She calls on her own generation, but really she calls on all of us to “speak out against the evil, to stop letting our government define things for us.” Never has there been a more crucial moment in history for us to heed this insightful teenager’s advice–in the US, and in the world, as the 2015 Climate Summit approaches, we are standing on the brink of absolute totalitarianism, and this may well be the most defining moment for us All to speak out, to act, to avert this catastrophe for humanity. Re-posted from Facebook and from Kris Anne Hall’s website (in excerpt), with thanks. It is interesting the way the application of the word “sovereign” is being altered. Changing the societal definition of words is a tool used by tyrants throughout history to enslave the people. Power emanates from Rights. We did not delegate Rights to government we delegated power. Government has nothing that is not sourced from the people. Government cannot exercise a power over you greater than YOU can exercise over your neighbor. Why? The source of all government power comes from the people and government cannot be greater than the individual source of its power. Given these explanations, the only proper application of Sovereignty is to that of the People. We are in possession of sovereign power. We are the supreme political authority. We are the paramount control of the constitution and frame of government and its administration. We are the self-sufficient source of political power, from which all specific political powers are derived. Government possesses NO autonomy and no power independent on its own. All government power is derived FROM the People, at the will of the People! So then next time you hear someone vilifying the idea of Sovereignty, remember the opposite of Sovereign is Slave. Is that who we think we are? It is who the government wants us to be. I have big hopes for my peers. We are the next generation of Americans! We cannot stand by and let our nation fall. Each person will answer to God for his/her decisions and actions to guard what God has blessed us with. You still have inalienable rights. You were born with the right to speak. What good does it do you if you never, ever use it?! Can we speak out against the evil, stop letting our government define things for us, and instead put government back in it’s rightful place?